Shirts With Random Triangles: Stanford RB Barry J. Sanders Transferring To Oklahoma St.
Stanford RB Barry J. Sanders Transferring To Oklahoma St.
Barry J. Sanders. Image via sfgate.com. It looks as though Oklahoma State will be adding a running back with a major pedigree and connection to the school to its 2016 rosterFormer Stanford running back Barry J Sanders announced announced that he would transfer to Oklahoma St. following his graduation from Stanford this coming June. Sanders told The Oklahoman that his father, legendary Oklahoma St. and Detroit Lions RB Barry Sanders, had given his blessing on the move. “His message to me was to keep an open mind,” Sanders said. “I think that he would have wanted me to look at more schools. He definitely didn’t want me to make a decision without considering other options. What I told him was that this was something I’ve been thinking about for some time. I just knew this was the right decision and the right fit for a variety of different reasons. 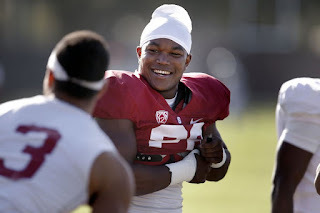 Sanders played in 36 games in his three seasons at Stanford. He served as the backup to the Cardinal's starting RB, Christian McCaffrey in 2015. With McCaffrey returning to Stanford, another season as a backup was presumably assured for Sanders. Louisville Has A New Hype Video For 2016. Former Dayton OL Zac Morgan Transfers To Oregon. USC AD Pat Haden To Step Down In June.